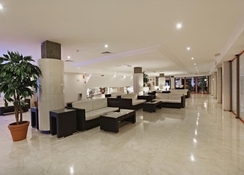 Marconfort Griego Hotel is an excellent all-inclusive, family-friendly hotel located in popular Torremolinos, just a kilometre from the lively town's fabulous beaches on Spain's Costa del Sol. 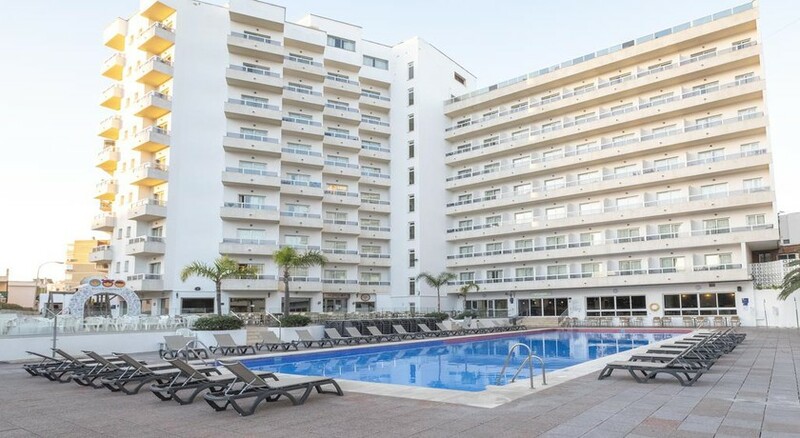 Stay in the heart of the Torremolinos' buzzing commercial district and take advantage of the excellent local facilities of restaurants and shopping without missing out on the waterfront splendour of four popular beaches just a short distance away. With its half-board and all-inclusive options, as well as superb on-site facilities, Marconfort Griego Hotel is a versatile and stylish option for a Costa del Sol holiday option whether you are travelling as a couple or as a family. Marconfort Griego Hotel is well-located amidst the four beautiful sandy strips of Carihuela Beach, Palo Beach, Pedregalejo Beach and Playamar Beach, with each easily accessed from the hotel. Many delightful restaurants, cafes and shops are situated in the neighbourhood. Furthermore, the pleasant La Batería Park and Torremolinos Bullring is less than two kilometres away, while trekking, hiking and golfing trips can be taken by guests. Marconfort Costa del Sol is 10.3km from the Málaga Airport. 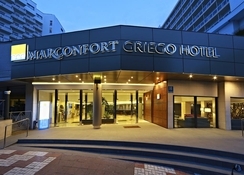 Marconfort Griego Hotel offers accommodation catering for every type of visitor. Guests can choose from Standard Rooms for up to four people, Pool View Rooms, Quintuple Rooms for up to five people (three adults & two children, or two adults & three children) and Quadruple Rooms ideal for families with its two beds and double sofa-bed. Spacious and modern, all guestrooms are designed to offer a comfortable stay furnished with large furnished balconies and en-suites with bath amenities. Wi-Fi internet, air conditioning, hairdryer, telephone and a television with satellite channels are also available. Marconfort Griego Hotel main restaurant serves breakfast, lunch and dinner in buffet style serving a wide range of international cuisine. The breakfast is largely continental but during lunch and dinnertime, several local and international delicacies are served. All-inclusive guests have free access to the Griego Beach Snack Bar, on El Lido Beach. The hotel also features a Pizzeria and a poolside snack bar serving snacks, light meals and alcoholic/light/soft drinks throughout the day. In evenings the Piano bar serves alcoholic and non-alcoholic drinks. Marconfort Griego Hotel features an outdoor swimming pool for adults and children with loungers, while there are regular pool entertainments and fun activities. A mini-club for children between the ages of 5 and 11 years keep them occupied in numerous activities and workshops. The hotel also arranges popular Evening Animation shows, organised by the staff members and international teams. 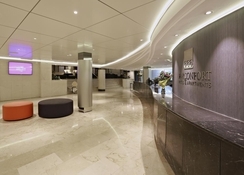 A fitness centre, shopping arcade and library are in the hotel premises and the beach has a wide range of options for motorised and non-motorised water sports activities. Very run down once you leave reception, but also very clean. We ate out even though we were all inclusive. Food hall very busy with poor quality food. Pool area very busy, however you can get a lounger if you're down at 9.30 or 10. They make you put out your own lounger which are stacked in the corner this can cause issues. Drinks and pool side snacks are good. Beach location and pool side bar was good except when you see thier other hotel at the beach and wished you stayed there. All in all we had a good time if you're on a budget you could do worse. Really handy for shops and bars but you need a bus to the beach. It's a very nice hotel. Friendly service and people. Good hotel, Manager especially helpful even though the hotel was full, used as a base. Enjoyed our stay. I thoroughly enjoyed our stay at this hotel.It is superbly situated to enjoy the town and all its bars, cafes and restaurants. All good recommended only the pool was to small so you have to wake up early to get seat and umbrellas by the pool .